The recent discovery of the works of previously unknown Irish-American philosopher, political essayist, actor, and musician Diogenes Booth has stunned the academic world. Among these are a brief autobiography, an extended commentary on the American Revolution, several essays on American politics during the Founding and early National periods, and even a full-length opera. In assessing this remarkable oeuvre, we can now conclude that Booth—whose family tree would come to include the famous family of assassin John Wilkes Booth—was an important influence on the thought of a diverse group of great thinkers and artists, including Edmund Burke, Alexander Hamilton, and even Wolfgang Amadeus Mozart. Born on April 1, 1750, in the small town of Till, Ireland, Booth was the son of a traveling quack doctor, Fodo, and an itinerant actress, Thole, who died in a freak stage accident when Diogenes was a mere six years old. (She was evidently hit in the head when a member of the theater’s orchestra dropped his ophicleide on her foot, injuring her big toe, which developed gangrene). Stricken with grief, the elder Booth took young Diogenes, the couple’s only child, out of Till and on the road with him, journeying from town to town throughout Ireland, plying his “trade.” According to Diogenes’ autobiography, Till’s Death Did I Part, as a young boy he sought out books to read at every opportunity while assisting his father on his house calls. Fodo Booth was a literate man, given to reading contemporary histories of the Ancient World (indeed, his love of the famous Greek philosopher, Diogenes the Cynic, had inspired his choice of name for his only child). Thus, the father encouraged the son’s interest in books and even at time traded with his educated clients his “treatments” and snake oil cures for tutoring sessions for his son. Thus, by the time he was sixteen years old, Diogenes had mastered many of the Greek and Latin classics, as well as both ancient languages—and ironically, given the cause of Thole Booth’s premature demise—the ophicleide. 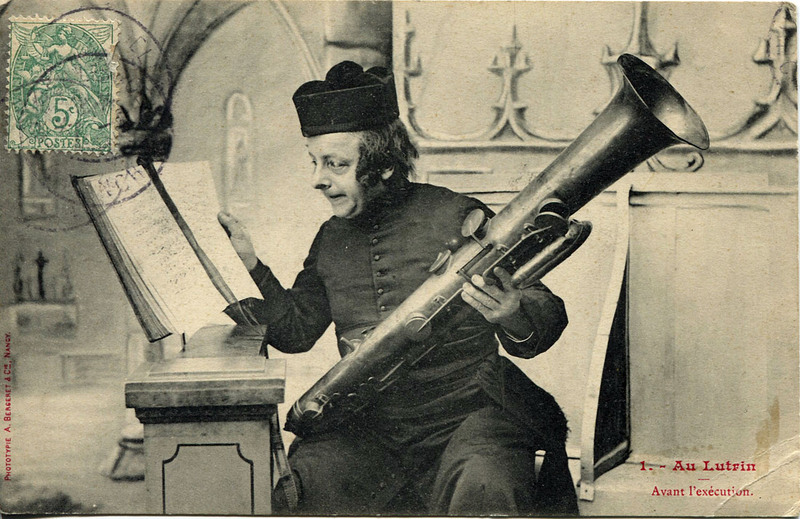 (One of Booth pere‘s patient/victims was a player of the instrument and had not only paid the “doctor” with lessons for Booth fils, but had provided the young boy with a rusty, somewhat warped, yet playable ophicleide.) One day in the fall of 1766, his father decided that the pair should flee Ireland for America, Fodo having earned many enemies whom he had robbed and often rendered blind, deaf, dumb, lame, and even dead through the practice of his brand of medicine. Tragically, the brand-new sailing vessel they chose for the voyage, named Old Bess, had been damaged in port at its christening, and thus capsized in a storm off the coast of North Carolina, and all aboard were killed save Diogenes, who was picked up by a New England trading vessel after clinging to his ophicleide on the water for two days. The ship’s captain, impressed with Diogenes’ brains–and his musical talent–dropped him at the port of Philadelphia, where he arranged an apprenticeship for the boy at a printer’s shop. This was the height of the imperial crisis between the American colonies and Great Britain, and Diogenes would witness the exciting political debates and events of the for the following decades, as he worked his way up in the world, becoming the master of the shop and penning essays, first on behalf of the Patriot cause and then on behalf of the Federalist party, always using one of a number of pseudonyms. Perhaps recalling how his father had had to flee Ireland due to angering the public, Diogenes was determined to avoid a similar fate by affixing his name to his work. 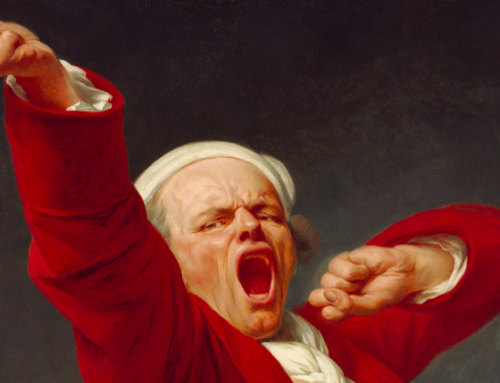 This rule applied too to the three one-act, comic operas penned by Booth during the period 1783-1789, which clearly became a model for Mozart’s “Da Ponte trilogy” that won the Austrian so much fame. (For these operas, Booth cleverly used the pen-name, Dionysius Tooth). Though clearly not on the level of Mozart’s genius, Booth’s are nevertheless enjoyable and clever productions, for which he wrote both the music and the libretto. All three daringly parody political groups and figures of the period: the first, The Marriage of Abigail (1783) centers on the attempt of Abigail Smith’s mother to prevent her daughter’s wedding the bumptious country lawyer, John Adams; the second, Don Gouverneur, or the Rake Punished (1785), pokes fun at the sexual escapades of the well-known New York lawyer and one-time member of the Continental Congress, Gouverneur Morris, the opera ending with Morris losing his leg in a carriage accident when fleeing a jealous husband; the last, The Anti-Federalists Are All Like That (1789), uses the trope of switched identities, with James Madison and Alexander Hamilton each disguising himself as the other during the Constitutional Convention to test the loyalty of their Federalist allies. How will this Revolution be remembered, we ask. Surely, I say, there will be no debate about its meaning and its purpose in the ages to come. No one will inflate the Declaration’s mention of man’s equality—if the prosaic text of that document is remembered at all—into a call for some bloody revolution against the natural aristocracy established by God Himself. No one will exaggerate too much the influence of that radical, John Locke, in the thinking of the men who led our Revolution and who designed the constitutions of this Confederation. All will recognize that the American struggle was simply an attempt to assert the rights of us as Englishmen, to which we were always entitled. Yea, then, let ours not be called the American Revolution, but rather the Conservative Revolution. Also, let not the idea of this nation as a shining city upon a hill be used to justify spreading our system of government across the globe by force of arms, for such a project has nothing ever to do with Conservatism. If my name is to be forgotten in the coming years, and indeed all my other works—through the will of Clio herself—I pray that the Almighty Himself grant that at least this one statement be recalled by posterity… perhaps at least as a sentiment expressed below signatures in correspondence, even by those who have not actually read this entire work, or any of it, or indeed any serious work in its entirety in their entire lives: “All it takes for evil men to succeed is for good men to do nothing.” And, I pray too, finally, that this singular expression of hope might never be misattributed to someone else. It is time to revive the name of Diogenes Booth for our time—and indeed all time—as America’s First Conservative. Richard T. Eulenspiegel is the Luther Martin (of Maryland) Professor of History at Utopia College in Falls Bluff, Maryland. A scholar of lesser-known personages throughout history and sports, he is the author of The Rise and Fall of Pope Joan: How One Woman Bucked the Misogyny of the Roman Catholic Church; Sidd Finch: The New York Mets' Once Great—and Now Forgotten—Prospect; and Remembering Captain J.S. Tuttle, Unsung Hero of the Korean War. I understand as well that Diogenes Booth was at Philadelphia in the summer of 1787 at the invitation of George Washington and took better notes of the convention than did James Madison. I eagerly await their being published April 1, 2017.